Presentations from the recent CHI Bioprocessing Summit in Boston illustrated how improving, tweaking, and applying process understanding can lead to even greater productivity, even in the age of multigram-per-liter cell cultures. Media and feed now receive most of the credit for cell culture productivity jumps, to the point where they remain an area of focus. Brandon Pence, global marketing director at Thermo Fisher Scientific, noted that the analytical tools employed by media designers and manufacturers to develop their products are now employed, inline, to bioprocessing. 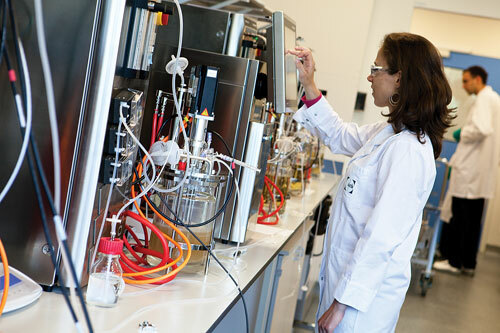 “These techniques—HPLC, mass spectrometry, and others—provide real-time feedback on the state of the culture by monitoring the consumption of nutrients,” Pence said, “to the point where they are even driving various formulation and feed strategies.” Process analytic technology enables processors to approach manufacturing in a more controlled fashion, to drive volumetric productivity without the risk of overfeeding, or overengineering formulation design. Thermo Fisher has dovetailed its strong instrument/PAT capabilities with media offerings and single-use bioreactors, and developed strategies, processes, and protocols around the integration of analytics into disposable processing. The success of PAT in cell culture depends on scale. In-line analysis is cumbersome in shaker flasks because of sampling and analysis logistics, and in some instances, sample size. Single-use bioreactors already at production scale can incorporate feed lines, removing samples in real time, and delivering them to an automated system for prep and analytical work. Moreover, these operations can occur without disrupting the culture, continuously, in real time. It has been almost a decade since the FDA issued its guidance on PAT. To describe progress as slow would be an understatement. Implementations remain principally within the domain of process development, with a few instances in full-scale manufacturing and even fewer in legacy processes. The reasons for low uptake are many and varied. Still, no one can be certain that large-scale biomanufacturing will employ comprehensive PAT, no matter how well it performed during development, at the 500 or 1000 L scale. In one scenario, bioprocessors will use PAT to gain process knowledge and understanding during development, design an optimized process, then migrate only a few PAT components forward. “The key will be controlling bioreactor production in such a way that does not inhibit the process itself,” Pence said. As Yuval Shimoni, Ph.D., principal engineer at Bayer HealthCare has noted, cell culture process improvement does not end with licensure as many believe. At the CHI conference, Dr. Shimoni demonstrated how changes to cell culture media can make a difference by increasing production capacity through greater cellular productivity. One might ask why something as straightforward as media optimization could not occur earlier in the development/manufacturing cycle. Dr. Shimoni explained that business drivers shift during the drug lifecycle. Before licensure, companies emphasize clinical safety and efficacy and timely market launch. Moreover, an early process lock limits opportunities for optimization. “After launch, and during the commercial production lifecycle, as the scope of market demand and the competitive business environment are elucidated, business drivers shift toward cost-of-goods reduction and assurance of supply to patients while maintaining product quality,” Dr. Shimoni added. Bayer’s corporate culture of continuous improvement and operational excellence, combined with diverse technical expertise, makes post-licensure projects like this possible. The firm’s fully integrated Berkeley, CA production site encompasses production, research, process development, and technology services at one location capable of collaborating with Bayer’s European facilities. Bayer Healthcare suggests that efforts to improve the cell culture process should not end with licensure. Instead, they should continue throughout the product’s life cycle. Shirley Peters, Ph.D., research scientist at UCB Celltech, has described a transient expression system that provides “incremental increases” in the yields of transiently expressed antibodies. Dr. Peters and co-workers developed their transient gene-expression system by optimizing several factors, including the transfection method, culture conditions, and host. The technique uses electroporation, which employs electric currents to create holes in cells that allow genes to pass through. In the group’s CHO platform, reducing the culture temperature after 24 hours and adding sodium butyrate at 72 hours improved antibody yield in UCB Celltech’s engineered CHOS-XE host. This approach is suited to generating antibodies and non-antibody proteins for research projects. Improving yields by optimizing culture conditions is not a new idea. Here the host has perhaps the greatest impact on productivity. “The most substantial impact on yield was observed when using a CHO host that was engineered to express exogenous XBP1-S and ERO1Lα,” Dr. Peters said. XBP1 is a transcription factor. When its mRNA is spliced (XBP1-S), it becomes a key regulator of the unfolded protein response (UPR), whose activation results in expression of multiple endoplasmic reticulum (ER) chaperones. “Overexpressing XBP1-S in CHO cells appears to improve the capacity of the ER to cope with recombinant antibody production,” Dr. Peters explained. ERO1Lα is involved in redox homeostasis of the ER. Overexpressing this factor augmented disulfide bond formation, and hence folding of recombinant antibodies. Over the seven years that UCB Celltech has been involved in this work, the combination of CHOS-XE and optimal process conditions has resulted in a 5.5-fold increase in antibody titer. “The engineered cells have an enlarged ER, altered expression of some ER chaperones, and an improved response to reductive stress,” Dr. Peters reported. UCB Celltech’s transient gene-expression system uses electroporation, which employs electric currents to create holes in cells that allow the passage of genes. As with permanent transfection, optimization of transiently expressed systems involves cell-line engineering, but with perhaps less emphasis on media and feed. Also at the CHI conference was Kate Strathearn, Ph.D., cell applications scientist at Corning Life Sciences. Dr. Strathearn discussed new techniques for increasing viral yields. Producers of vaccines and other biologics have used traditional technologies for a number of years, for example, roller bottles, shake flasks, and multilayer cell culture vessels. The shortcomings of these platforms include the ability to generate and manufacture, particularly under cGMP, large quantities of vaccines without increasing spatial footprint. Each technology, moreover, has its unique limitations. For example, roller bottles require the purchase of additional accessories such as roller racks, whereas larger multilayer vessels may have an unequal distribution of oxygen throughout the vessel, resulting in oxygen-deprived cells. Dr. Strathearn discussed a new Corning offering that she described as a “breakthrough technology” that allows high yields in a small footprint. The company’s HYPER technology platform utilizes a gas-permeable film as an attachment surface, eliminating the requirement for an air gap found in traditional cell culture vessels. By eliminating the need for the air gap characteristic of traditional virus culture technologies, the HYPER technology provides a compact vessel with increased growth area. For example, HYPERStack-36 layer (18,000 cm2) cell culture vessels have a spatial footprint similar to that of a 10-layer stacked vessel (6,360 cm2), and a growth area on par with 22 roller bottles, 80 T-225 flasks, or 3 10-layer stacked cell culture vessels. The advantages of HYPER over conventional techniques include smaller footprint, uniform gas exchange throughout the entire vessel, time savings (one vessel processed instead of multiple roller bottles or multilayer vessels), reduced variability in batch harvest (product isolated from the same vessel, at the same time, under the same conditions), platforms designed specifically for closed systems applications, and adherence to ISO 6 cleanroom standards for cell therapy applications. 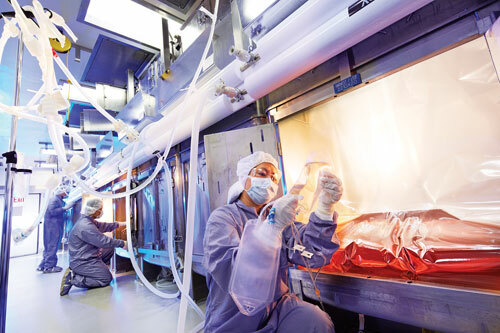 “These vessels can also be connected in a sterile environment in series or parallel with other units thus providing larger platform assemblies,” Dr. Strathearn said. For virus cultivation, HYPER provides a uniform gas exchange throughout the platform. As a result, for long-term studies of seven or more days in culture, the health of the cells could be improved, resulting in higher virus production. “For example, we have previously demonstrated higher production per square centimeter of crude adenoviral particles on the HYPERFlask compared to a T-flask through a two-week study,” Dr. Strathearn explained. For short-term studies of less than about four days, her group demonstrated similar viral production per unit area for lentivirus and adenovirus, thereby generating a larger quantity of viral particles in a similar spatial footprint.